“My dream has always been for Jackson Farming Company to last much longer than I do,” Founder Brent Jackson says. 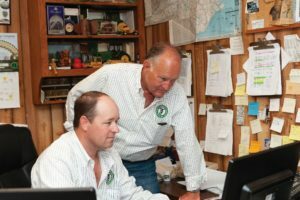 Jackson Farming Company is a powerhouse in Autryville, NC. It operates on more than 1,000 acres, embraces new technology, manages a sprawling workforce, and helps shape farming policy locally, statewide, and nationally. And it’s reached these achievements in a single generation. “My dream has always been for Jackson Farming Company to last much longer than I do,” Co-founder Brent Jackson says. His wife Debbie founded the farm with him. And in 2017, he made an important step to fulfilling that dream. He retired, passing the baton to his son Rodney. 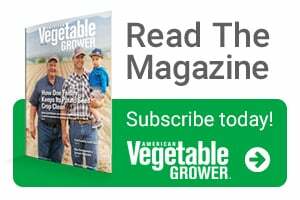 How Brent, and now Rodney, are shaping the farm into a healthy, thriving operation that will likely last for generations to come is why it’s earned the coveted American Vegetable GrowerSM 2018 Grower Achievement Award. Editor’s note: The Jacksons will be accepting the 2018 Grower Achievement Award in Washington, D.C., at United Fresh Produce Association’s Washington Conference on Tuesday, September 25. The award is given in cooperation with United Fresh. Also, I’d like to thank Brandt, which is sponsoring this article. Brent and Rodney Jackson pride themselves on being sustainable. Yes, sustainable in how crews manage crops, but also sustainable labor practices, financial practices, and taking calculated risks that will sustain the future. Production. Jackson Farming Company’s sensors and gauges keep an eye on which nutrients to apply and which ones to not apply, cutting down on runoff. In addition to limiting inputs on crops, the operation uses drip irrigation and controls erosion with cover crops. Employees. From the Jacksons’ point of view, sustainability applies to a steady workforce. To do that, the farm must offer workers what they need to support their own families. “We do our best to find the right people and treat them well,” Rodney says. “About 60% of our workers have been with us more than 10 years, and 40% have been here more than 20 years. We’ve got an 85% return rate. Pretty good, considering,” Brent says. Crops grown. Farm workers prefer longer seasons in order to make more money annually without moving every couple of months. To offer their crews a nine-month season, Jackson Farming Company has expanded what it grows to include early and late crops. “We’ve added sweet potatoes from September to November, and broccoli as a spring crop,” Brent says. The farm uses H-2A workers for seasonal work, and local workers for year-round jobs. Having more crops also offers insulation for when crops underperform or prices plummet. Simply put, it’s risk management. “We’ve had bad melon years,” Brent says. Rotating row crops with specialty crops is another way the operation is sustainable. Wednesday afternoons are set aside for reviewing financials and creating strategies to keep the farm on the path. Every Wednesday afternoon, Rodney gets together with Brent to review the newly released weekly financials. It’s a way for the two to take a step back and view the bigger picture. Much of the data the two review comes directly from the technology they have in place (more on that soon). It gives them a more complete picture of the operation’s health. Plus, the paper trail provides an added bonus: “It makes working with banks easier,” Brent says. The Jacksons also understand that they need talent to complement their own. “You have to realize what your own weaknesses are. If you know you’re not good at something, acquire the talent,” Rodney says. He also recognizes that he sometimes has to bypass jobs he’d love to do in order to effectively run the business. “I’m an engineer, a hands-on person. I’m not a sales person,” he says. 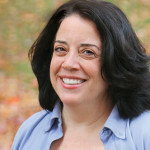 “In my role in the company, I can’t afford to operate equipment, even though I’m good at that and would like that. I train operators to work at the level I would. I don’t get to do what I like to do. I do what’s best for the company,” Rodney says. Jackson Farming Company embraces new technology to keep the farm sustainable financially. “We’ve always been on the cutting edge of technology,” Rodney says. Technology is great for finding ways to increase efficiency, cut down on repetitive tasks, and reduce waste, he says. It allows workers to fertigate fields only to the levels needed, guides tractors to make the best use of a field, even if the best drivers are not working that day. And it helps truckers find the most efficient routes, helps crews trace produce from the field to the cooler, and tracks which crew member is working on which task. The data gathered from hand-held scanners, sensors, and drones allows the senior teams to strategize, and not just react to issues on the farm. They can measure how much fuel is used per tractor per crop, giving them a realistic idea of costs per foot, per crop. When so little in farming is within a growers’ control — think drought, labor shortages, or hail — technology gives growers a bit more room to make decisions that matter. Robotics interests Rodney. He thinks it holds the potential to transform his packing houses. Drones are another technology that holds appeal. The crew has been trying them out, flying the field, then checking it over in person afterward. With H-2A and year-round employees, Jackson Farming Company’s production fields are well covered. But one labor area is proving to be frustratingly elusive: technology-savvy analysts. The usual fallback for skilled labor is to use a consultant. But their expertise lies in agronomy and disease, Brent and Rodney say. With all these advances, Brent’s dream of building a farm to last the generations is alive and well. Congratulations again to the Jacksons! Jackson Farming Company got its start in 1979 when Brent and Debbie Jackson began growing soybeans on the 5 acres he’d inherited. By 1981, he realized that row crops could be volatile, price-wise, and so grew his first watermelon — the crop the company is best known for today. He soon added cantaloupes, finding both melons to be much more profitable. In 1998, he began acquiring more acreage, buying whatever land in his area came onto the market at a reasonable price. As a result, the farm isn’t a contiguous property, but rather a collection of smaller production plots. Most of those plots are within 15 miles of the farm’s home base. Today, Jackson Farming Company grows a wide range of vegetable crops as well as a few commodity crops in multiple states, including contract growers in Florida. BRANDT is pleased to support the Grower Achievement Award. 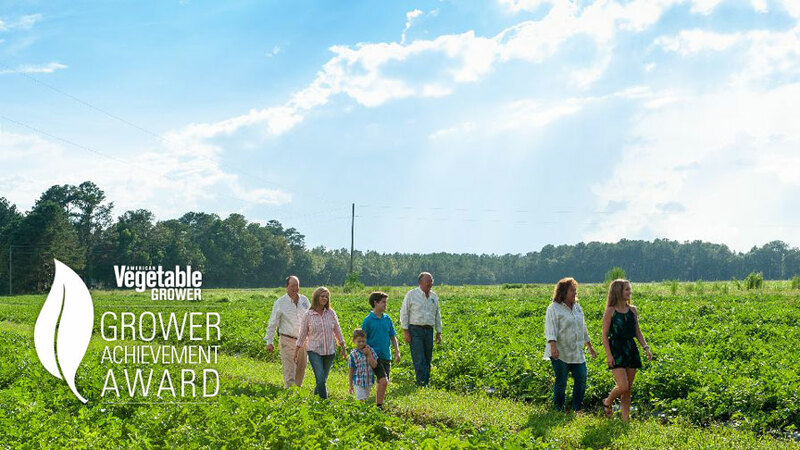 Recipients of this award are proven leaders in agriculture that demonstrate innovation in their operations, involvement in the vegetable industry, and good stewardship of the land. BRANDT’s goal is to help growers enhance their operations by bringing new plant health technologies to the farm that advance quality, yield, and sustainability. We salute all Grower Achievement Award recipients — this year’s winner and those from past years — for their hard work and contributions to excellence in the vegetable industry.